Items from The News, Navy News and Warship World are reproduced by kind permission of David Brown, Sarah Fletcher and Steve Bush respectively. Click on the thumbnails to enlarge them. 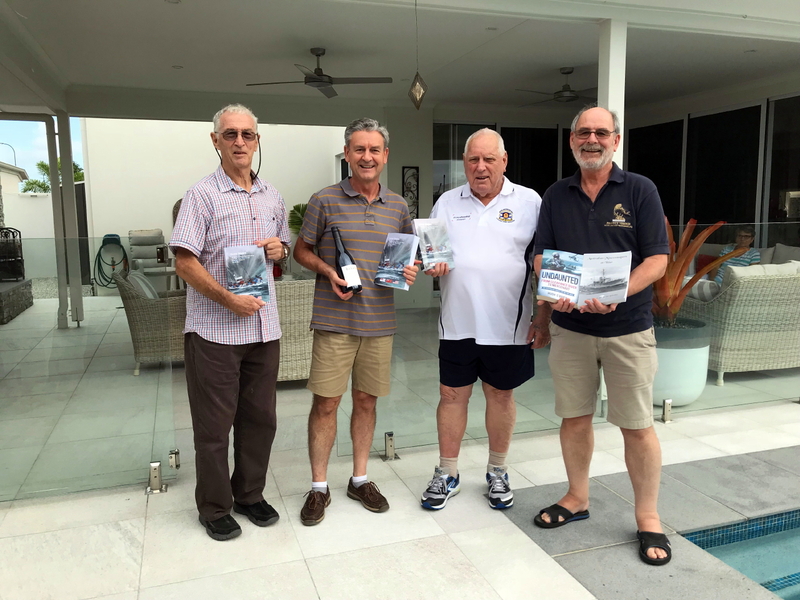 I must thank CD branch legend Eamon 'Ginge' Fullen QGM for sending me the fourth in his excellent series of illustrated chronicles of veteran Royal Navy divers in which he has captured so many memories. 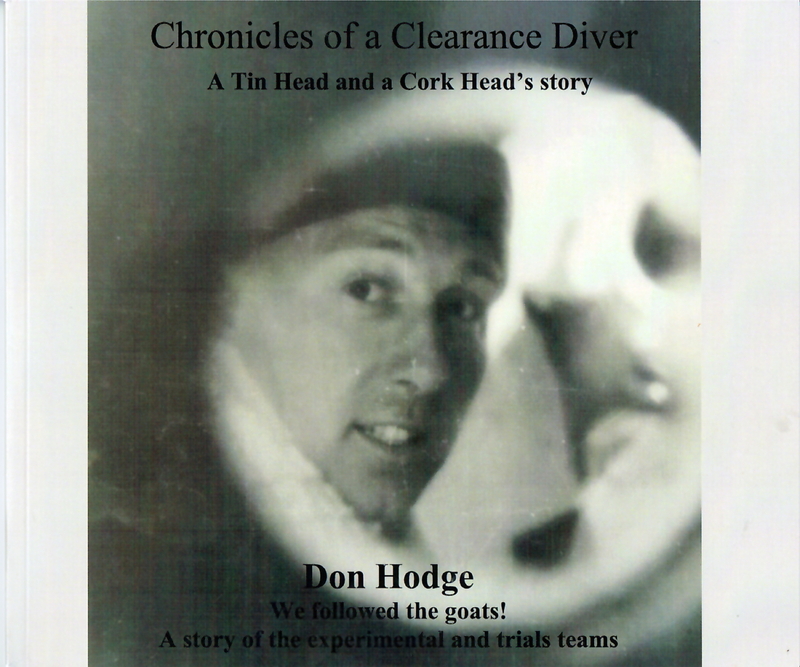 The latest features Don Hodge who joined the Royal Navy in 1952 and qualified as a D3 standard diver in 1959. 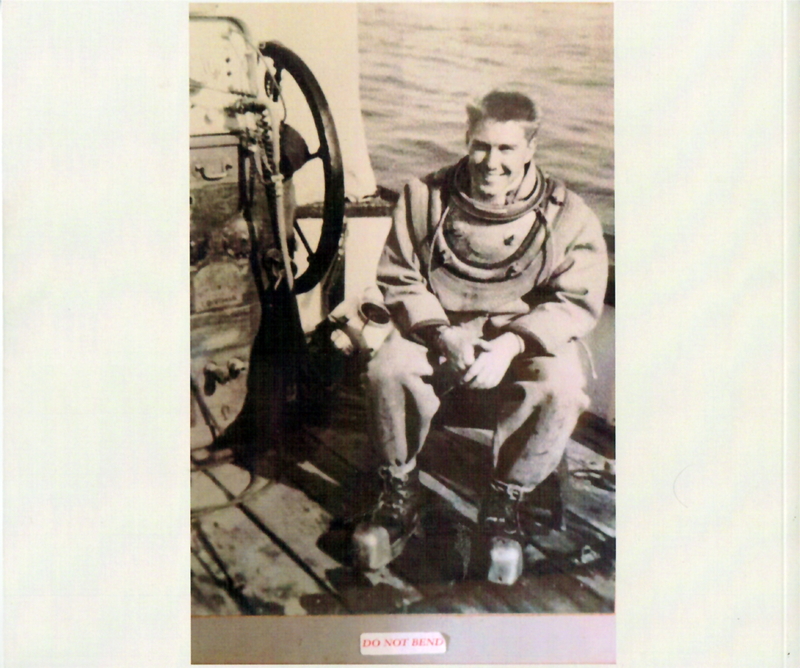 He qualified as a clearance diver in 1962 and, during his eventful service career, participated in setting new depth records when working for AEDU (the Admiralty Experimental Diving Unit). 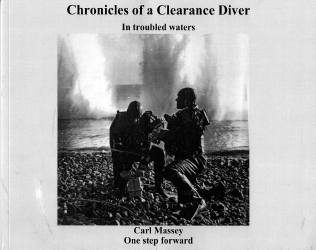 He left the Royal Navy as a CPO(D) in 1976 for a second career in commercial diving but his last dive in standard dress was in Horsea Lake courtesy of the HDS (Historical Diving Society) in April last year. I took this photo of Don with his trainee-CD son Mortimer at Horsea Island in October 2016. Mortimer was named after the late MCDOA member Lt Cdr Morty Drummond, Don's Commanding Officer in HMS Reclaim. All four volumes should be available for sale from the RNCDA website's online shop via www.rncda.com. 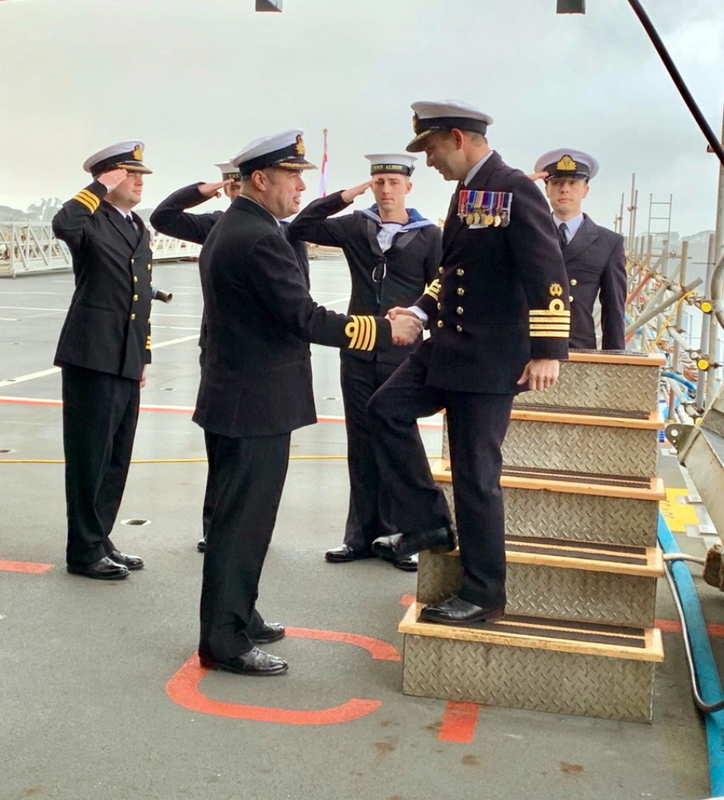 Congratulations to CPO(D) Kris Fenwick QGM of Portsmouth-based Southern Diving Unit 2 (SDU2) on being selected for promotion to WO1(D) with effect from 31 March 2020. 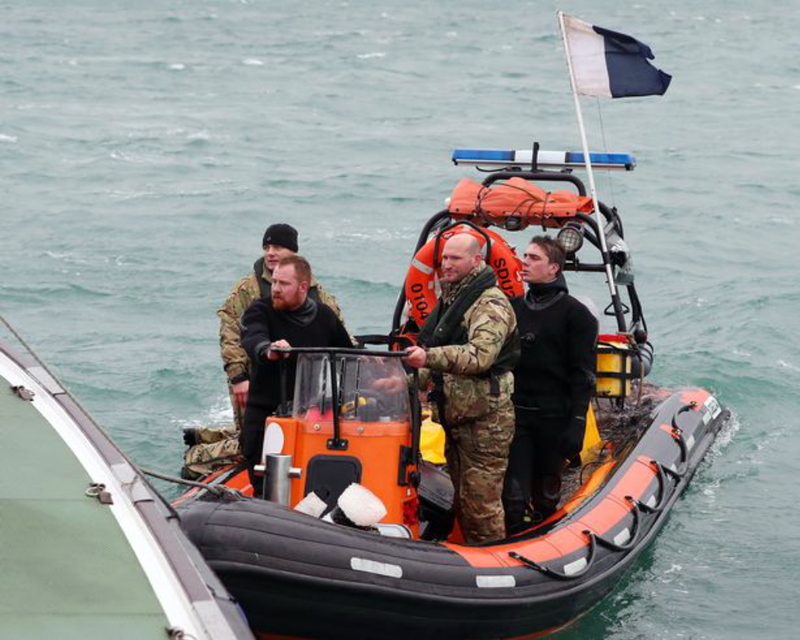 Kris is second from the right in this photo taken during the disposal of a bomb dredged up in Portsmouth harbour in February 2017 (also see entries forr 19 Aug 18 in News Archive 63 andd 23 Nov 18 on this page). I regret to report the deathh in Thailandd earlier today of MCDOA member Colin Dodd. He had been ill in hospital for some weeks. 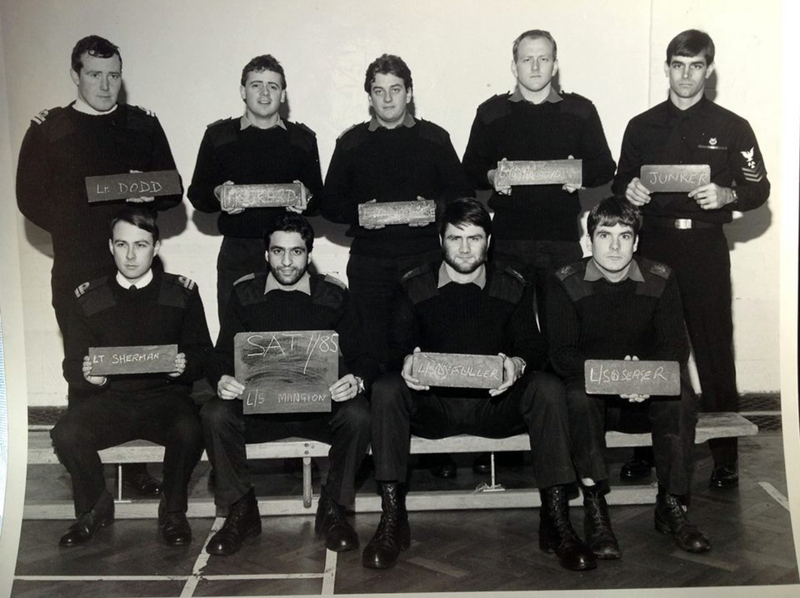 Colin joined the Royal Navy in 1973 and qualified as an MCD Officer on LMCDO '79 with Bill Chambers, Tim Curd, Allan Rankin, Andy Ryan, Gordon Stamp, Dennis 'Taff' Sweeney, Colin Welborn and Svenn Olav Kalvo RNoN. 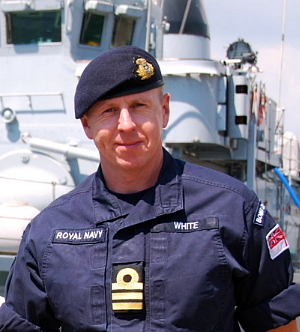 He served in HMS Minerva (1974), HMS Brereton (1975/76), HMS Berwick (1977), HMS Juno (1978/79), HMS Wilton (1980), HMS Iveston (1981 to 1983), HMS Vernon (1984), on exchange with the Canadian Navy at the Experimental Diving Unit of DCIEM (Defence & Civil Institute of Environmental Medicine) in Toronto (1985 to 1987), COMMW (1988/89), SMOPS Nelson ex-HMS Vernon where he set up operator training for the Sandown class minehunterss(1990 to 1992)), RNR Sussex (1993) and the staff of SofD (Superintendent of Diving) in 1994. 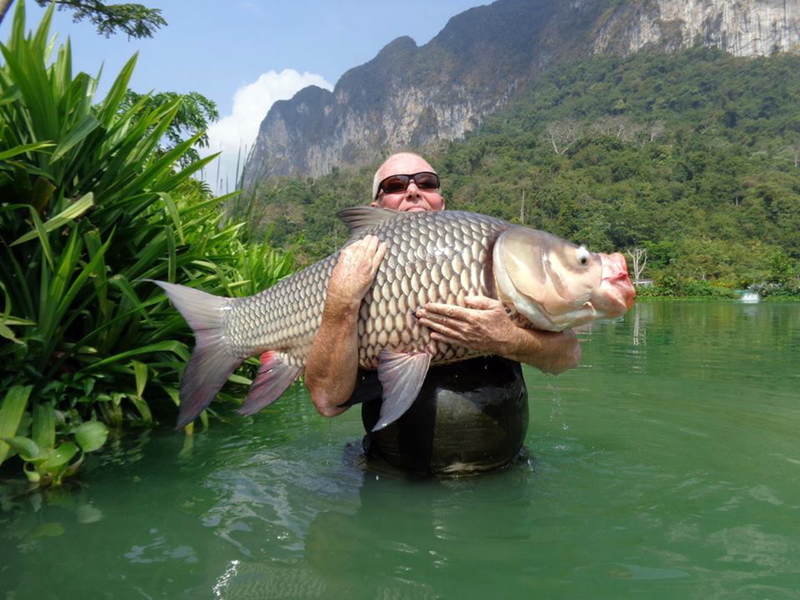 After opting for compulsory redundancy, Colin left the RN in 1994 and resided for many years in Phuket, Thailand where he indulged his passions for golf, fishing, dogs and motorcycling. I am sure all members of our community will join me in extending our sincere condolences to Colin's family and friends. 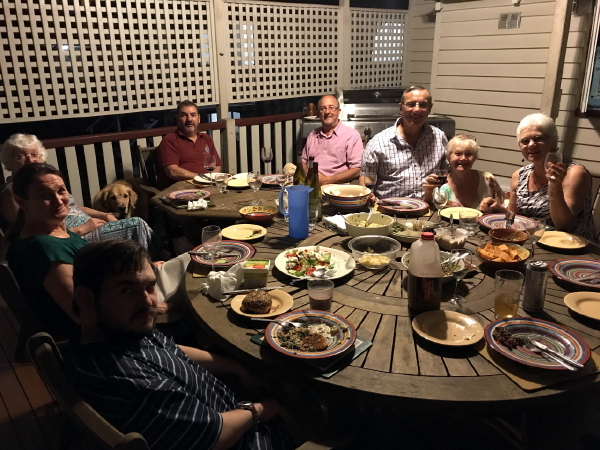 Happy Australia Day to all our mates down under (see entry forr 15 Apr 18 in News Archive 62). 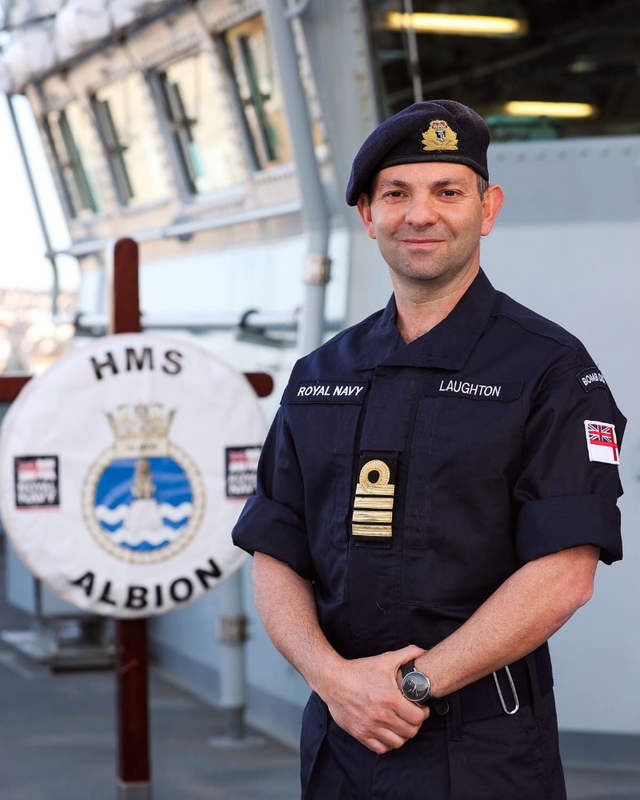 Congratulations to MCDOA memberr Peter Laughton on assuming Command off HMS Albion on the 15th of this month. 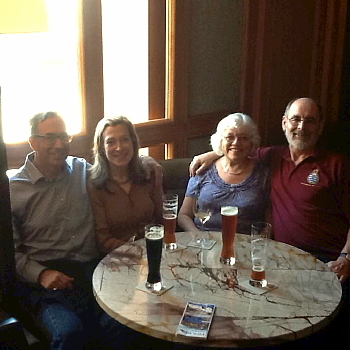 "Thank you Rob and good to hear from you. I feel extremely proud and honoured to command the Fleet Flagship. I also hope it sends a very powerful and motivating message to our more junior MCDOs - there are no limits when you join the Branch! And of coursee [MCDOA President] Roger Readwin (we were both on LMCDO '98A) assumes Command of BRNC in Sep - a first for the Branch! Will drop you a note in the next few weeks! 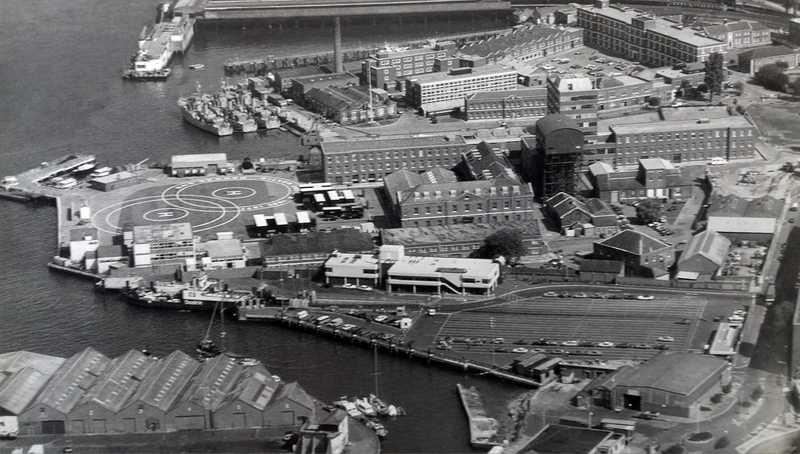 These aerial views of HMS Vernon have recently come to light. 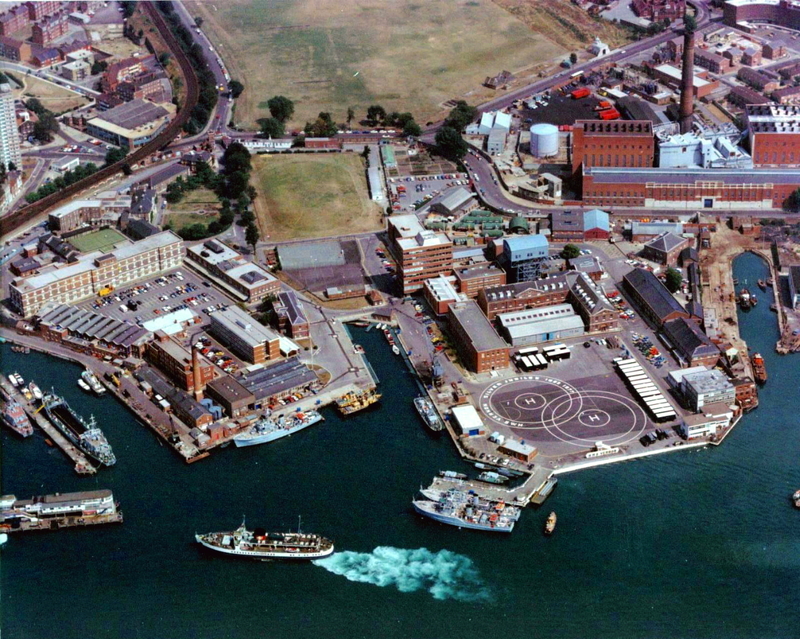 The first image shows HMS Vernon and Old Portsmouth in 1965. Three TON class MCMVs are berthed on Maintenance Jetty, another in Vernon Creek and a fifth on Marlborough Pier. The RCT Tank Landing Craft 'Ardennes' and 'Arakan' are berthed on the Army's Gunwharf Jetty between Vernon and Portsmouth Harbour station. 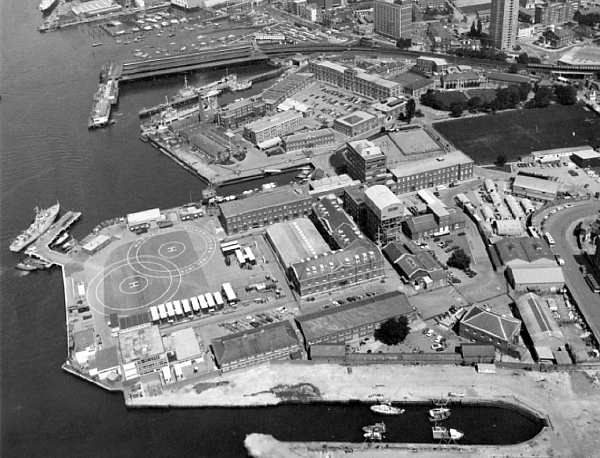 The second image shows HMS Vernonn in 1984 withh the newly completed IOW car ferry terminal, previously located at the bottom of Broad Street in Old Portsmouth. Three TON class MCMVs are berthed on Maintenance Jetty. Scott Block, Creasy Centre, Creasy South and Creasy East had been built since the first photo was taken. 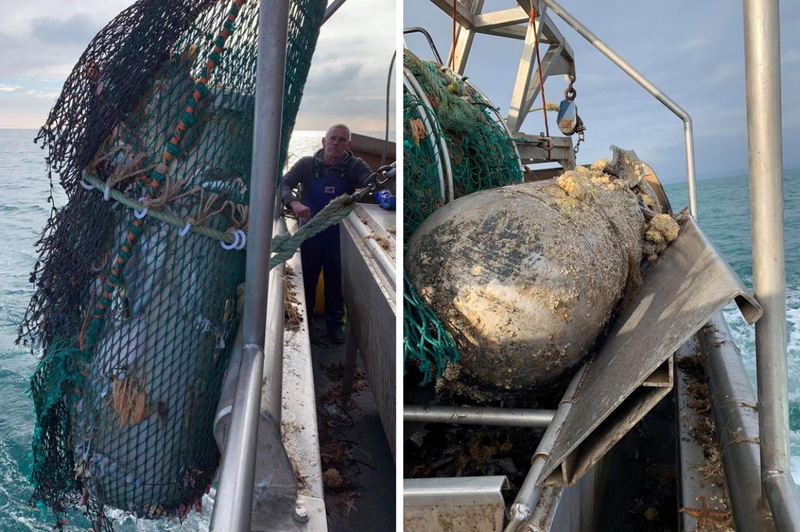 The Devon Live website containss this article, including video, of yesterday's disposal by members of Plymouth-based Southern Diving Unit 1 (SDU1) of what looks suspiciously like a German GC ground mine trawled up by a Brixham-based fishing vessel. 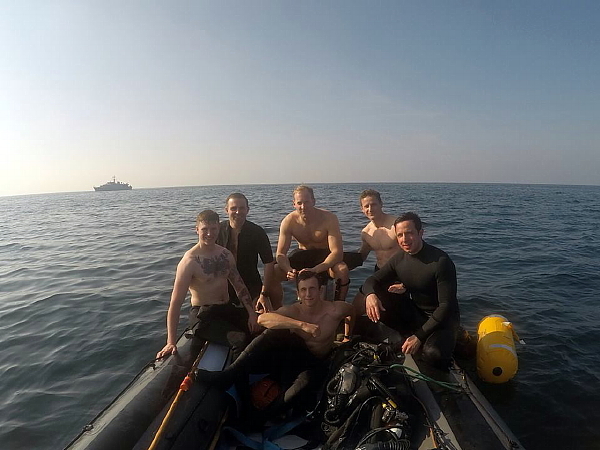 Members of SDU1 had attended another EOD incident in Brixham on Saturday. 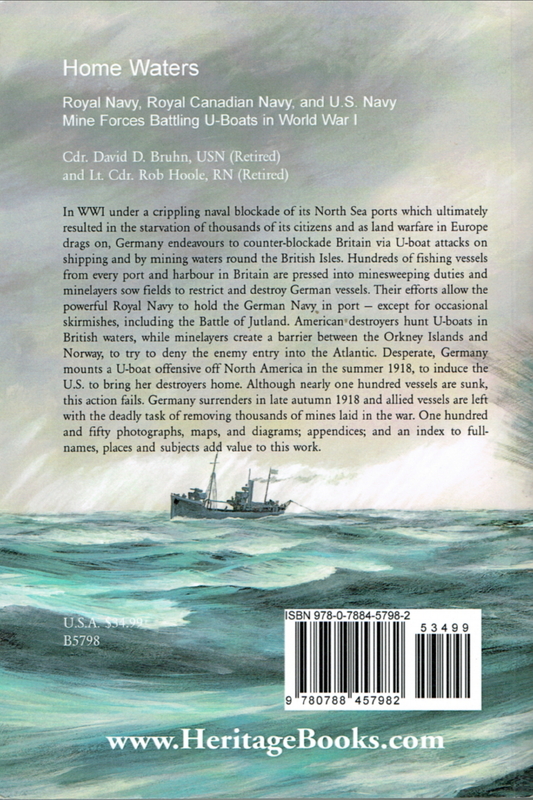 Naval Party 2444 Dunkirk 19th January 1945. Signed by Lieutenant RNR, Commanding Officer. I don’t have any other information and wonder whether you might be able to point me in the right direction or whether any of your members may have known him. NP (Naval Party) 2444 was the second ‘P’ (Port Clearance) Party of divers intended for deployment to the Far East but the Japanese surrendered before it was ready. It was based at HMS VERNON(D) at Brixham Aug/Sep 1945 and Calais and Dunkirk from Oct 1945 until its disbandment in March 1946. The (D) after HMS VERNON stood for ‘Dartmouth’ where the unit’s accounts were held. 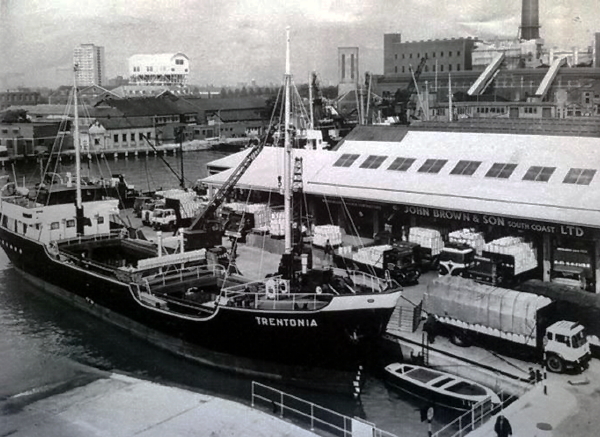 “…There was one port in western Europe which had so far not been touched by "P" Parties. 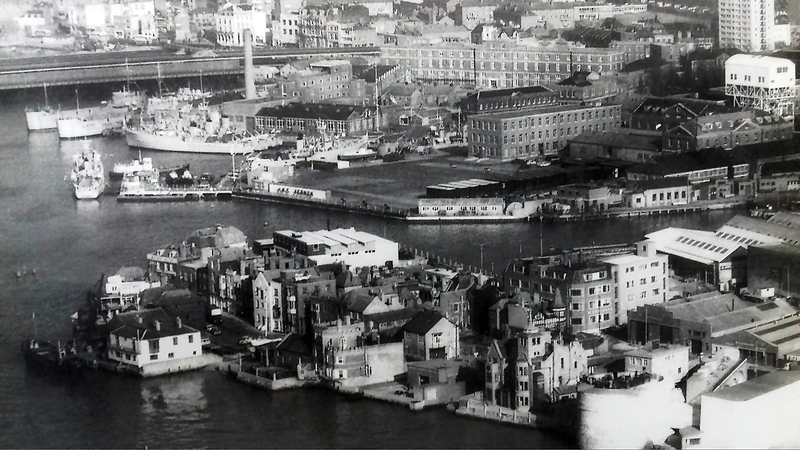 This was Dunkirk, which sent a sudden call for assistance before the clearance of Bremen had been quite completed. It seemed that twenty-seven mines had been reported laid by the enemy and all trace of these had since been lost. Gutteridge was despatched with a small operational Party (No. 2444) and with a young officer, newly trained at Brixham, Sub Lt W O [Walter Owen] Trought RNVR* to assist him. The work proved very tiresome and difficult because of the swift tides scouring the harbour entrance and the bad, wintry weather. The Party were helped by a few German divers and seamen who collectively had some half-dozen words of English. If anything, the British Party knew rather less German. But Petty Officer Cook, by gesticulation and by sheer will power, soon had the Germans laying jackstays with something of the precision of a "P" Party. Searching at Dunkirk was to drag on until March 1946. Four mines were found and it could only be presumed that the others reported had sunk too deeply in the mud to be traced. 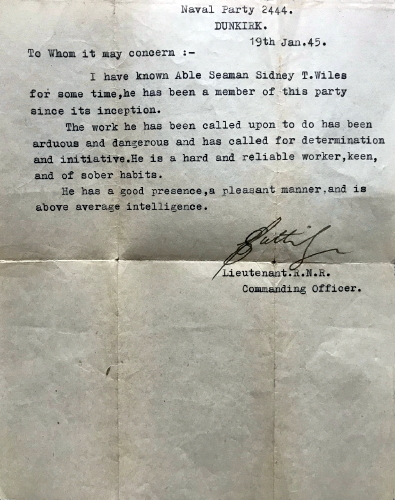 Cdr Aubrey Rowland Alston OBE RN, who signed your father’s certificate, was gazetted for his appointment as an OBE (Officer of the Most Excellent Order of the British Empire) on 11 July 1940 “…in recognition of distinguished services during the War.” He was appointed to HMS VERNON(P) in Portsmouth on 27 Oct 1944 for service at HMS VERNON(D) following service with the Admiralty's Director of Torpedoes and Mining..
Lt Cdr Leslie Gordon Gutteridge OBE FRSA RN had a long and distinguished career both during and after the Second World War. I never met him but I have a file of his correspondence and I knew many of his RN friends and colleagues. 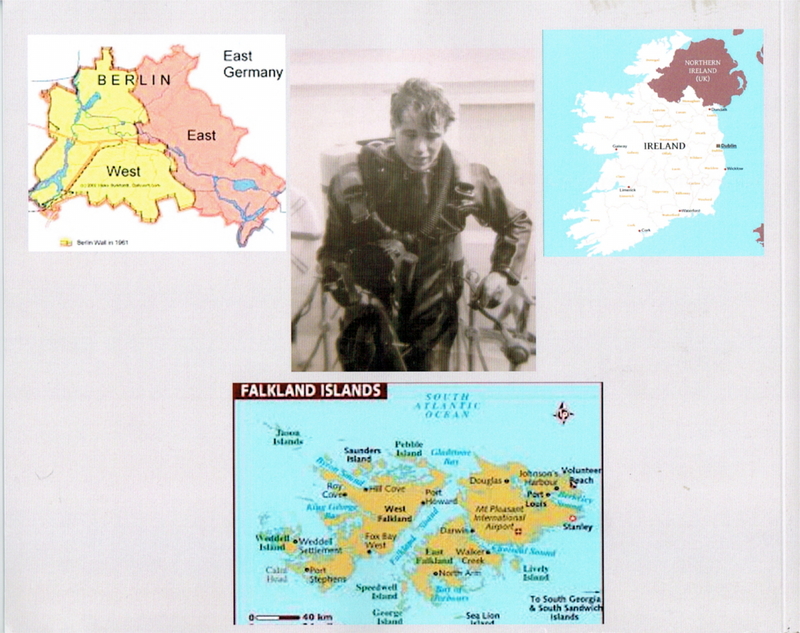 Please read about the ‘RN Clearance Diving Branch’ in the MCDOA website’s Branch History section. There is a search facility on the website’s ‘Home’ page. Don’t hesitate to contact me if you have more questions. 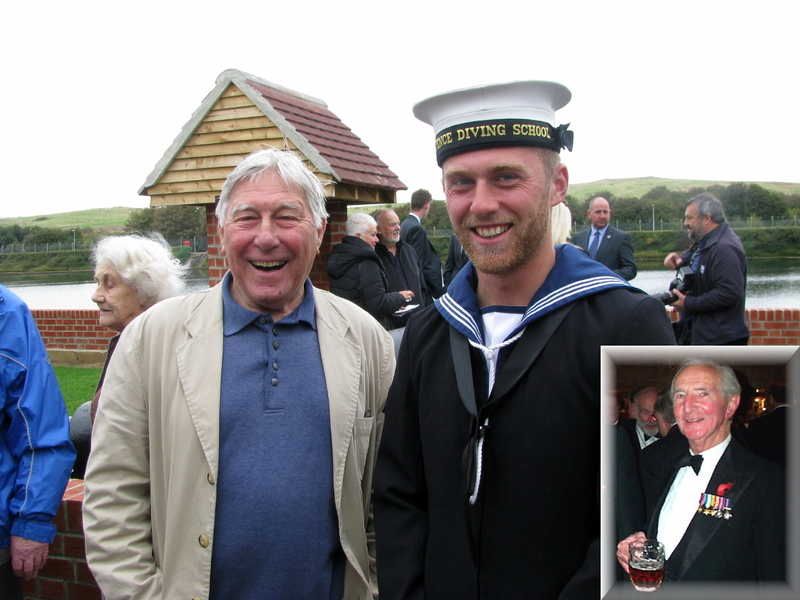 * Of note, Sub Lt Walter Trought RNVR went on to serve at HMS Mount Stewart, the Naval Special Operations training base at Teignmouth in Devon, from 30 December 1945. This was where SOE (Special Operations Executive) instructors trained small boat personnel, destined for employment in Europe and the Far East, in weapons, contact drills, fieldcraft and CQB (Close Quarters Battle), usually in groups of eight men at a time. The establishment paid off on 28 February 1946. I subsequently received this response from Jo..
"Thank you very much for the information. I will make the application for his records and have a read of all the information/links you have sent. The letter I have is dated 19th January 1945 DUNKIRK. It is almost like a personal reference. I have attached it just for your interest. 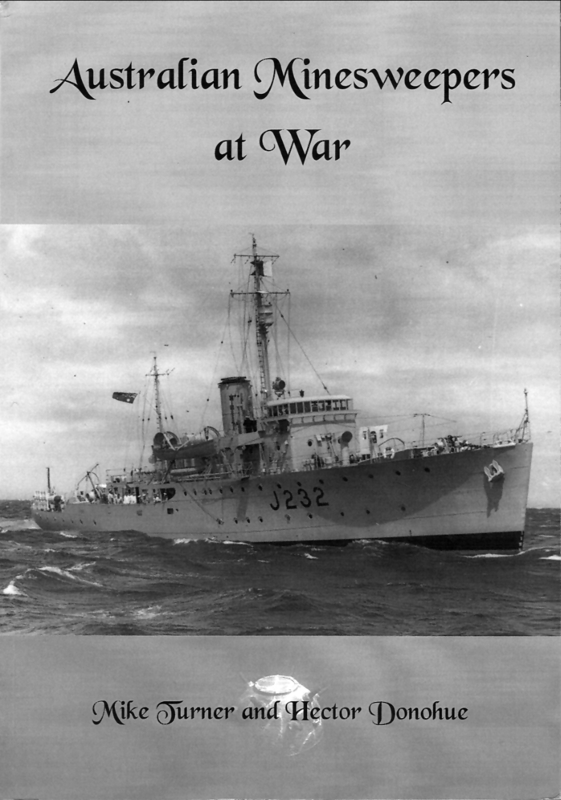 Your letter is signed by Lt Leslie Gordon Gutteridge RNVR (later Lt Cdr RN) who died on 26 May 2002 at the age of 81. Gordon Gutteridge was a senior founding member of the 'P' Parties that cleared North African and European ports of ordnance in the wake of the German withdrawal at the end of WW II. 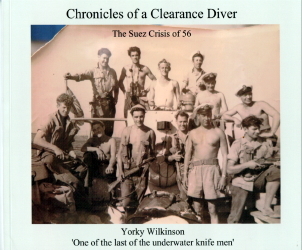 As such, he was a direct forebear of the RN Clearance Diver branch. The following abbreviated extracts from Rear Admiral Nicho Poland's book,, 'The Torpedomen - The Story of HMS Vernon 1872-1986', and other sources, describe how Gordon Gutteridge made such a significant contribution to RN clearance diving and mine disposal. 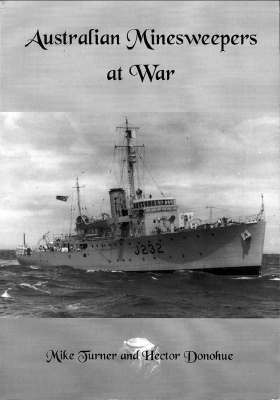 During the 8th Army's advance from El Alamein, a small team of mine disposal ratings under Lt (later Cdr) George Herbert Goodman GC MBE RNVR and Lt Gordon Gutteridge RNR were detached from Rear Admiral (Alexandria)'s staff to be the first naval personnel into each of the newly occupied Western Desert ports. At Bardia, Sollum, Mersa Matruh and Benghazi they were faced with booby traps, tank and anti-personnel mines, demolition charges, depth charges and naval mines. 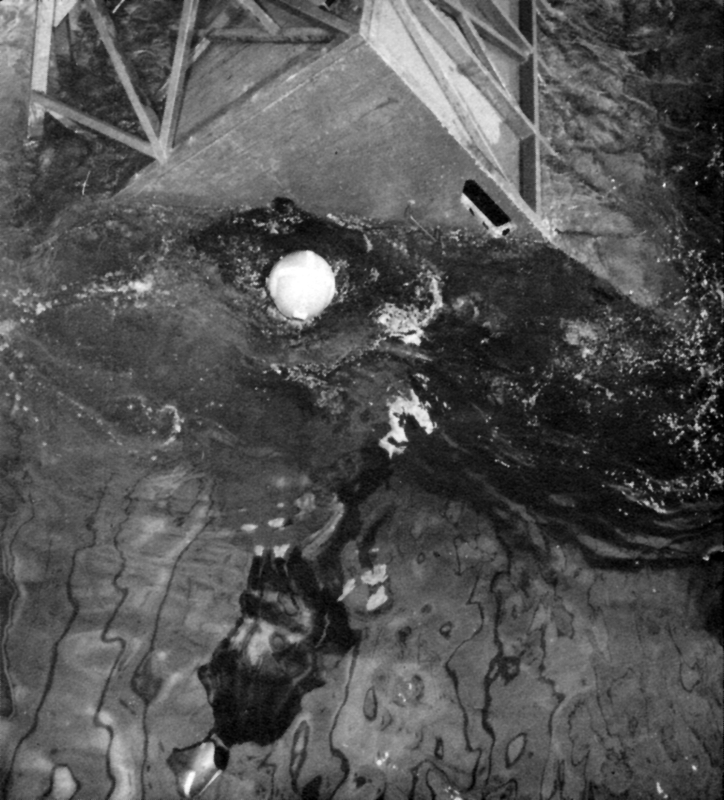 Being without diving apparatus, they were obliged to swim down to investigate underwater hazards. At the end of the only serviceable jetty at Sollum, they found two depth charges placed in about 15 feet of water. 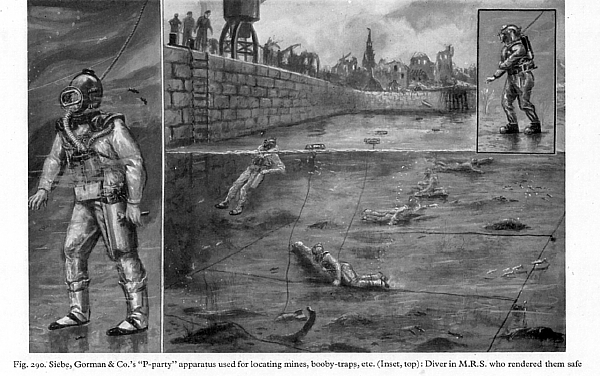 Gutteridge, swimming down, discovered two wires leading into the silt and ending in a red cover plate at one end. On removing the coverplate, the mechanism inside started to tick but when Gutteridge pulled on a chrome plated spindle, the ticking stopped. Becoming short of breath, he surfaced and clambered up a rusty ladder before covering one hundred yards in record time. 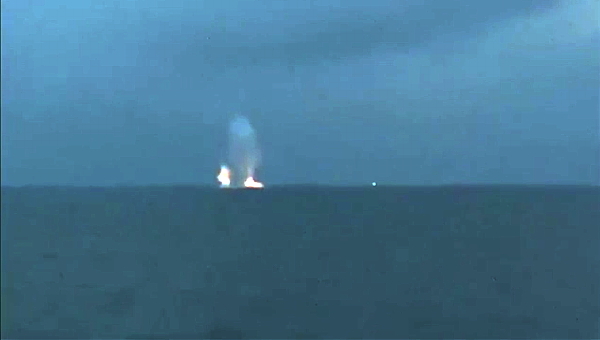 The expected explosion did not take place and the depth charges were successfully removed. 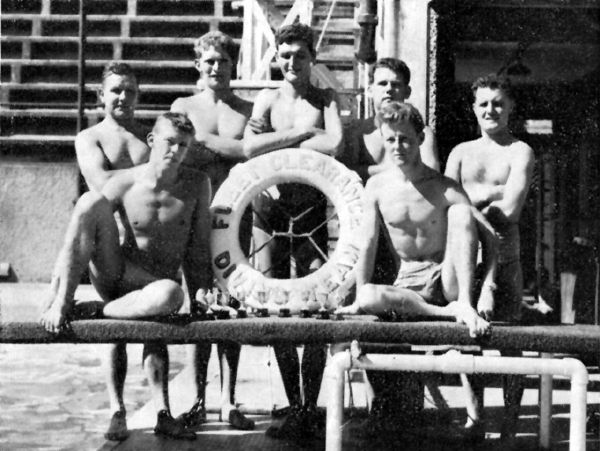 At Tobruk, Gutteridge and his team were sent to investigate a 'ticking' at Navy House. They searched room by room and cellar by cellar. It was a wet, smelly and lonely business. Eventually, the ticking was traced to a halyard block on the flag pole. Moving in the wind, it was striking the mast at a rate of 60 times a minute. 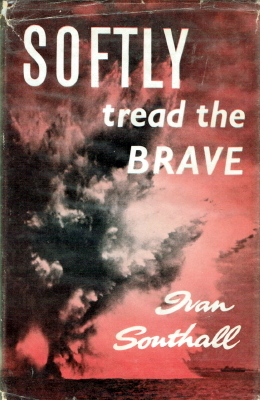 At Benghazi, Gutteridge and his driver were caught by a booby trap. Both received second degree burns which required treatment in a field hospital. They then drove the 600 miles back to Alexandria. 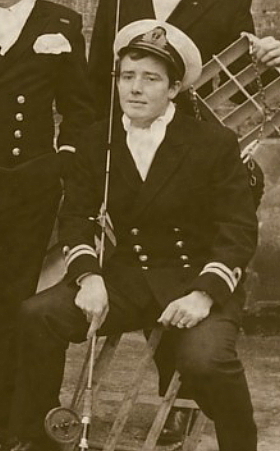 In the Spring of 1945, Gutteridge was second-in-command of Naval Party 1571 under Lt Cdr G Gosse RN. 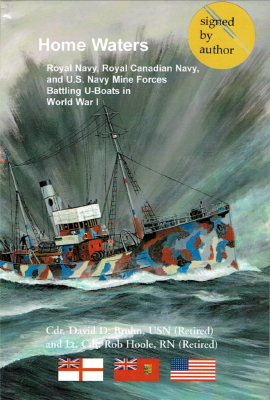 NP 1571 was one of six 'P' Parties that had cleared Caen, Boulogne, Calais, Brest, Dieppe, Le Havre, Rouen, Antwerp, Terneuzen, Zeebrugge, the South Beveland Canal and Flushing. 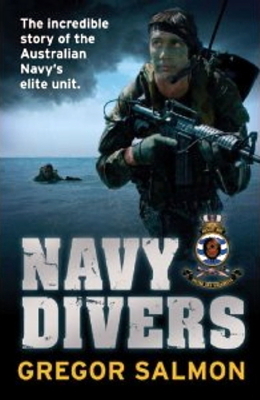 The procedure was for the clearance divers to locate a mine and then report the find to the officer who then dived to render the mine harmless or to explode it if it was safe to do so. 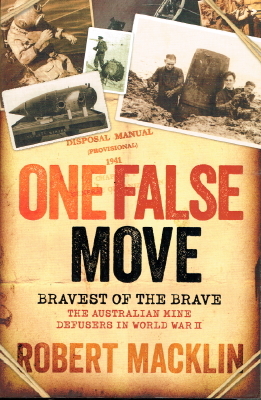 On one occasion, a 'G' type pressure mine was discovered resting on a body. Gosse, tended by Gutteridge, worked in two feet of mud in the dark water to remove the primer and bring the mine to the surface. 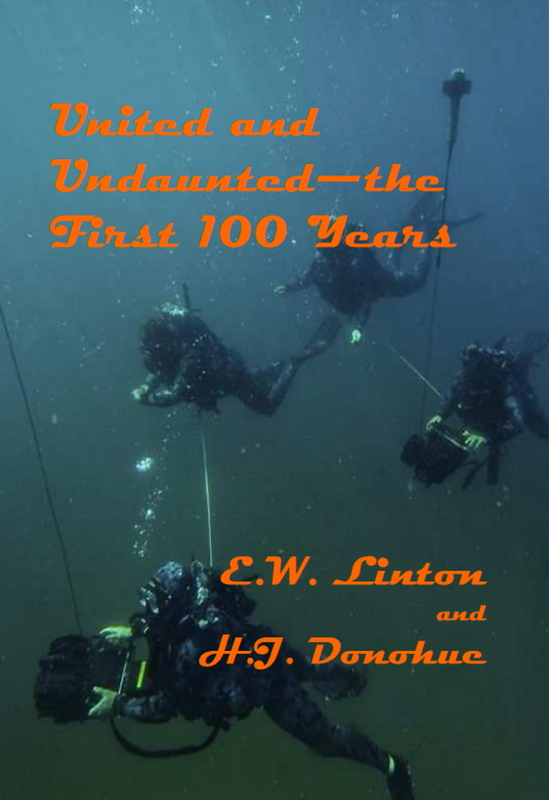 Later in 1945, Gutteridge and eight divers were lent to the French Navy to assist in removing mines from France's third largest harbour at Dunkirk. Since the French had little or no mine clearance capability, Gutteridge suggested that a large British 'P' Party should be formed to perform the task. The Admiralty reacted positively and NP 2444 was commissioned with a complement of 4 officers, 1 sick berth attendant, 1 cook and 40 divers. 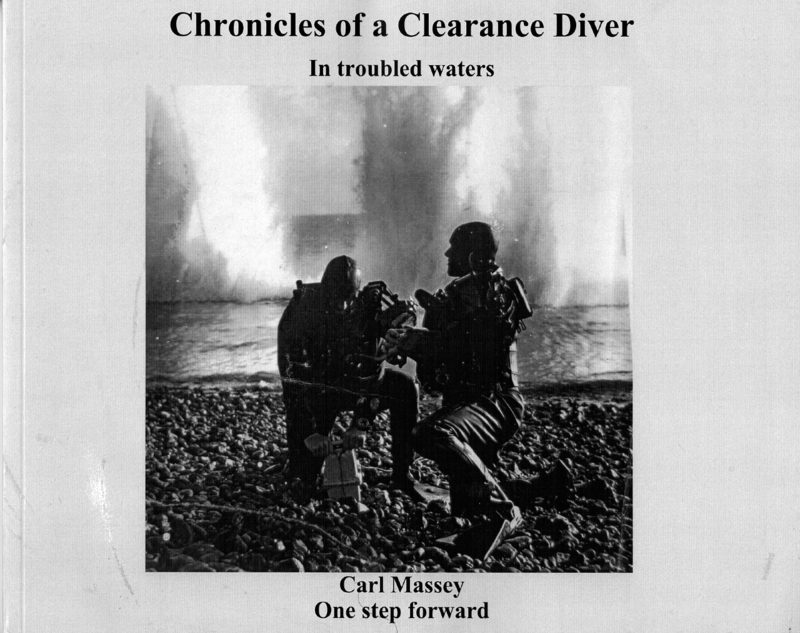 All the personnel were qualified to dive. 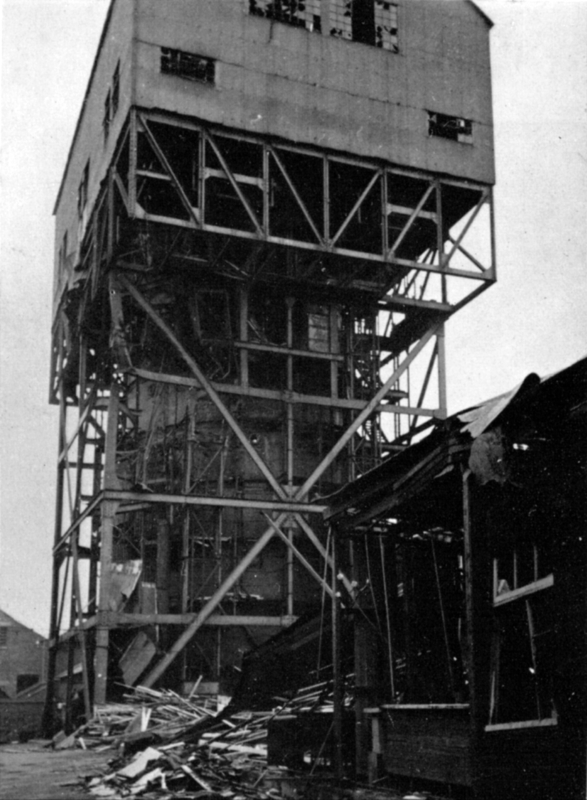 When the 'P' Parties were disbanded in Mar 1946, their eventual bag was 219 mines, 121 explosive charges of one type or another and one V2 rocket, all without the loss of a single individual. 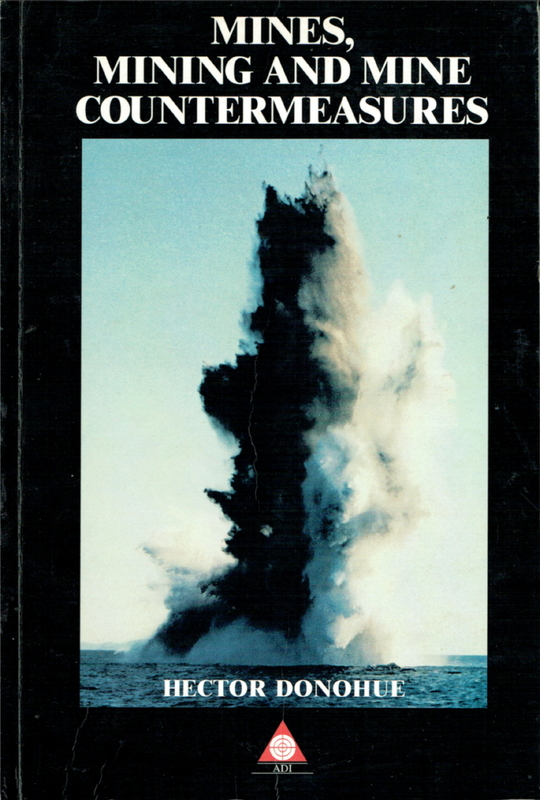 After the war, the remnants of NP 2444, led by Gutteridge, formed the core of the RN's clearance diving capability based at Lochinvar, ridding UK waters of remaining German and British mines. In 1951, clearance diving training moved from Lochinvar to Vernon (home until then of the deep divers) where a Clearance Diving School was established. Gutteridge moved to UCWE (Underwater Countermeasures & Weapons Establishment) at West Leigh House near Havant, together with the Experimental Diving Trials Team, to concentrate on the scientific study of diving problems while working in close liaison with the Superintendent of Diving at HMS Vernon. 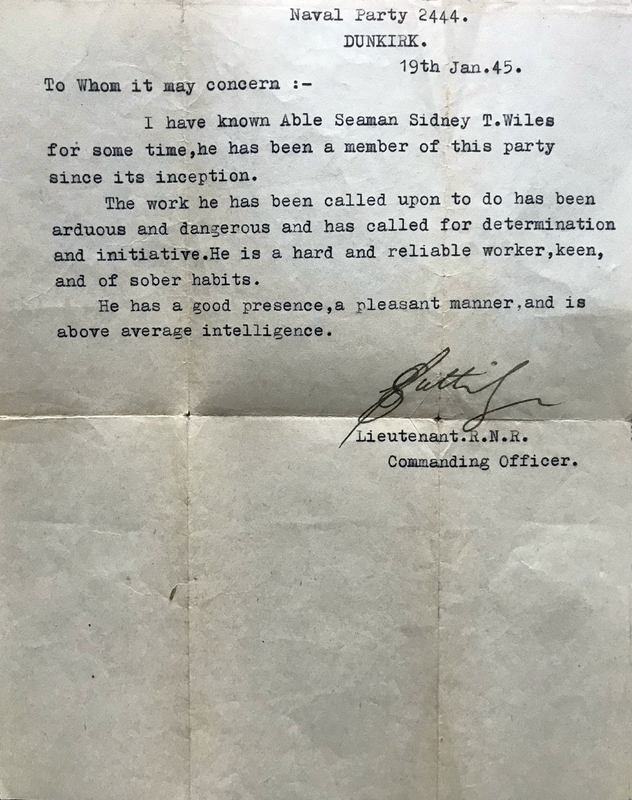 The appointment to this post of Cdr R F Harland from Lochinvar confirmed a new era in which scientists, engineers, medical specialists and divers began to work in harmony. As Gutteridge put it, "Old hostilities wore away, new blood was introduced and only healthy competition remained." 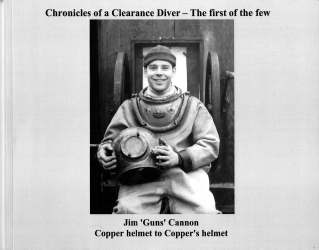 For a while, Gutteridge was assisted by the legendary Cdr John Ouvry who had been recalled to write a new manual on rendering mines safe but problems were encountered when Cdr Lionel 'Buster' Crabb was recalled to service and promoted over Gutteridge's head to command the Experimental Clearance Diving Team. This was intended to allow Gutteridge to concentrate on research work but it had unfortunate effects as Crabb, in Gutteridge's words 'distrusted scientists and avoided all things scientific'. Together with Lt Cdr 'Uncle' Bill Filer who went on to head the Acceptance Trials Team in Vernon and the Diving Trials Unit at Alverstoke, Gutteridge oversaw the development and introduction into service of new diving apparatus, the first inflateable dinghy (Gemini), underwater comms, mine investigation and render safe techniques and equipment. He was also responsible for the formally registered design of the watch face of the Rolex Perpetual Oyster which became a standard issue to RN divers; the first watch to reach the top of Mt Everest and the first to go into space. 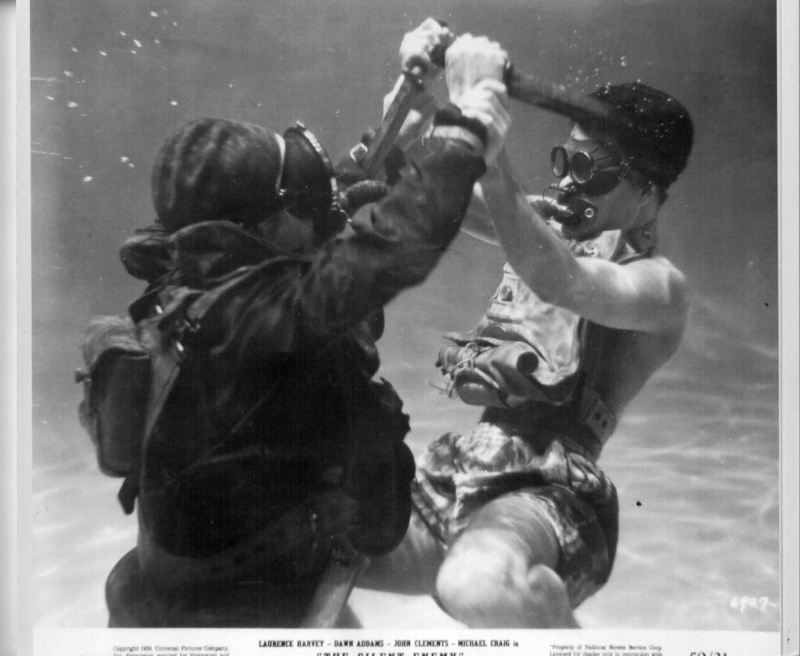 In 1954, Gordon Gutteridge and Bill Filer were invited to the USA where they demonstrated the Mine Recovery Outfit (including automated mine recovery lifting bag), shaped charge render safe techniques, non-magnetic tools, the diving watch, underwater radiography and mine dismantling techniques. In return, they inspected new and experimental diving equipment. 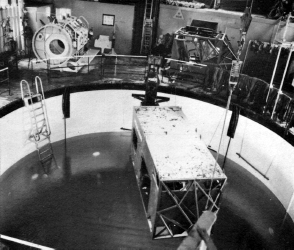 They were most impressed by the 'wet and dry' chamber for conducting diving experiments down to 500 ft under controlled conditions. 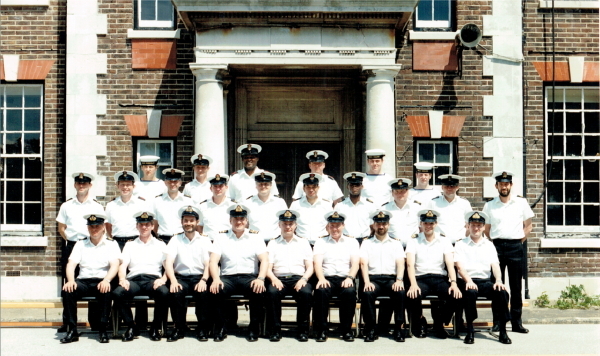 Some eight years later, this equipment was introduced into the RN. 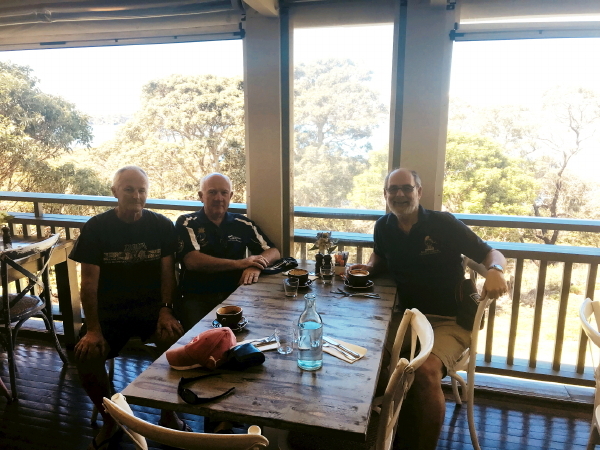 While in the USA, Gutteridge and Filer also visited the Mine Countermeasures Base at Charleston where they 'flew' the Aerojet Corporation's Minisub; a free-flooding diver's aid to mobility. It had two speeds: 3 1/2 kts and 7 knts. Gutteridge obtained a similar minisub for UCWE which underwent trials at Horsea Island and at Falmouth. 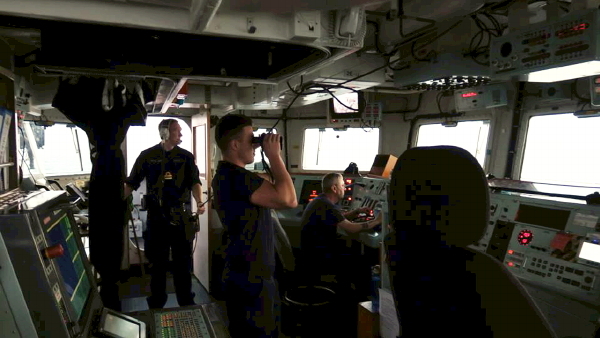 The trials were disappointing, and the RN decided to concentrate instead on the towed diver search which had also been observed during the American visit. 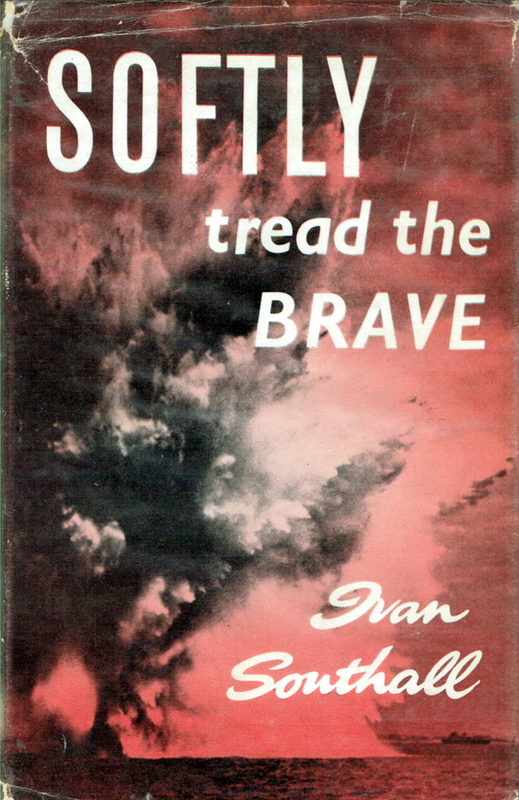 In April 1956, Gutteridge was one of the last people to see Lionel ‘Buster’ Crabb before his disappearance in mysterious circumstances during the visit of the Soviet cruiser Ordzhonikidze to Portsmouth with Bulganin and Kruschev and he provided a detailed description of the events leading up to the incident. In January 1957, Gordon Gutteridge was appointed an OBE for leading a UCWE team that rendered safe a German mine found buried in mud and rubbish underwater in a heavily populated area of London's West India Docks. The attached photo shows Gordon Gutteridge (centre) as OIC of the FECDT (Far East Clearance Diving Team) in Singapore in 1957. I daresay he retired from the RN as a Lt Cdr soon afterwards because I have no further information on him after this. "Thank you so much for all this amazing information. 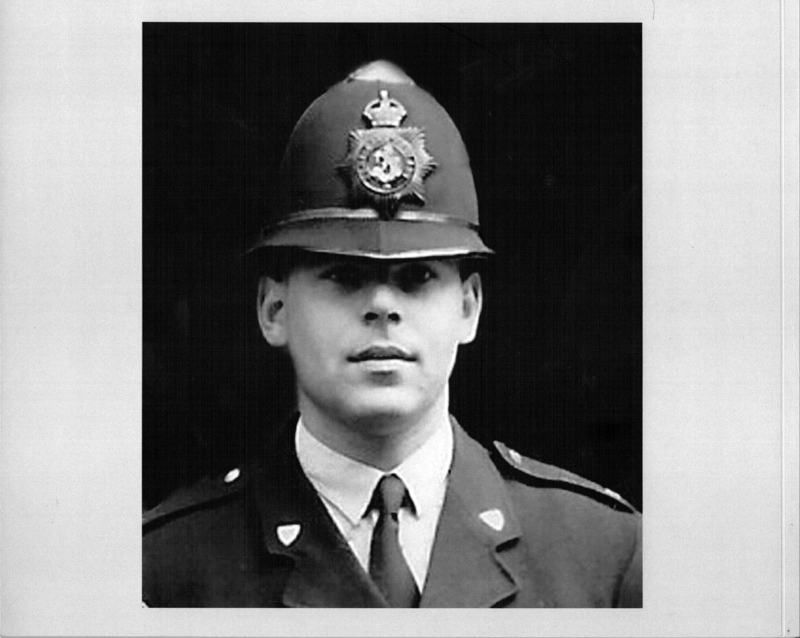 I’m looking forward to getting my dad's records to try to understand the timeline and how long he served. The letter from Gordon Gutteridge is dated Jan 45 Dunkirk so I am trying to work out whether my dad was present or whether it was written and forwarded to him because he married his first wife sometime between April and June of 1945. Just as a little background, my dad was born in 1921 in Mayfair but grew up in Mile End, East London. He was one of five children. I think all of them, excluding his sister, served in the forces at one time or another but I don’t know all their names. My sister says he chose the Navy because he liked the uniform! He married his first wife in 1945 and had his first daughter. After the death of his wife he met my mother (22 years his junior!) and they had me in 1980. He was 61 at the time and he died in 1986. I know very little about his life as my mum passed ten years ago and the only things I have are the letter from Gordon Gutteridge and a certificate of proficiency. My half sister also knows nothing more than I do about his time as a diver. 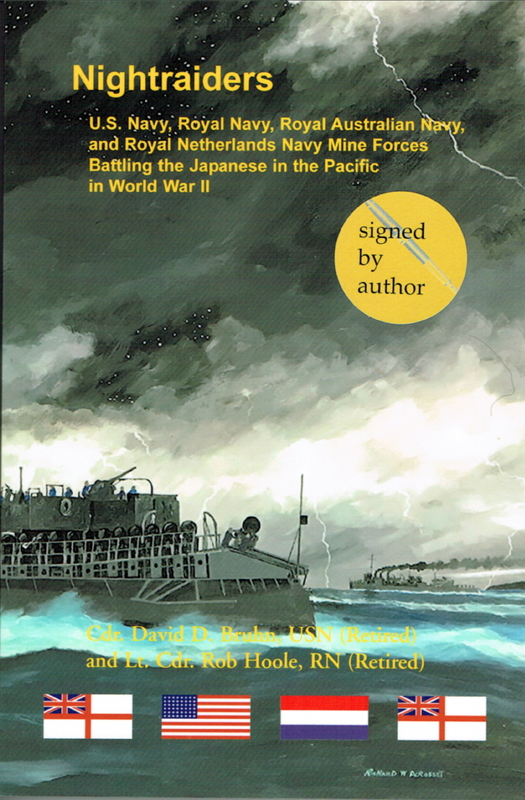 Your humble Webmaster's first consignment off 'Nightraiders - US Navy, Royal Navy, Royal Australian Navy and Royal Netherlands Navy Mine Forces Battling the Japanese in the Pacific in World War II' has arrived from the USA (see entry for 15 Dec 18 in News Archive 64).. 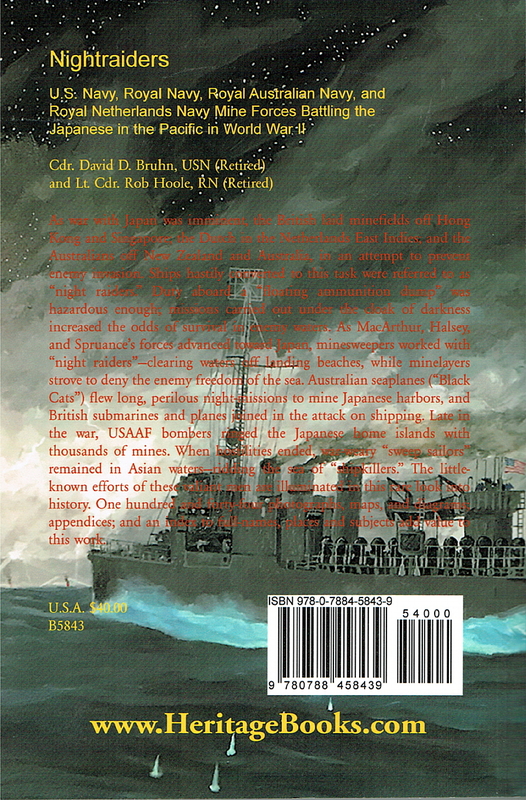 This is the second volume of the trilogy that started with 'Home Waters''andd is co-authored byy Cdr David Bruhn USN and Yours Truly (Rob Hoole). 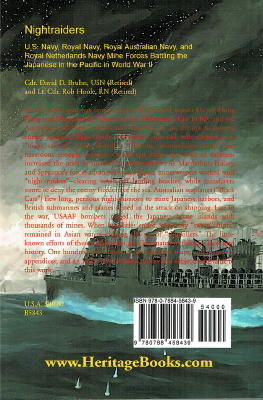 It is available from the American publisher, Heritage Books, at a cost of $40 plus P&P to the UK. 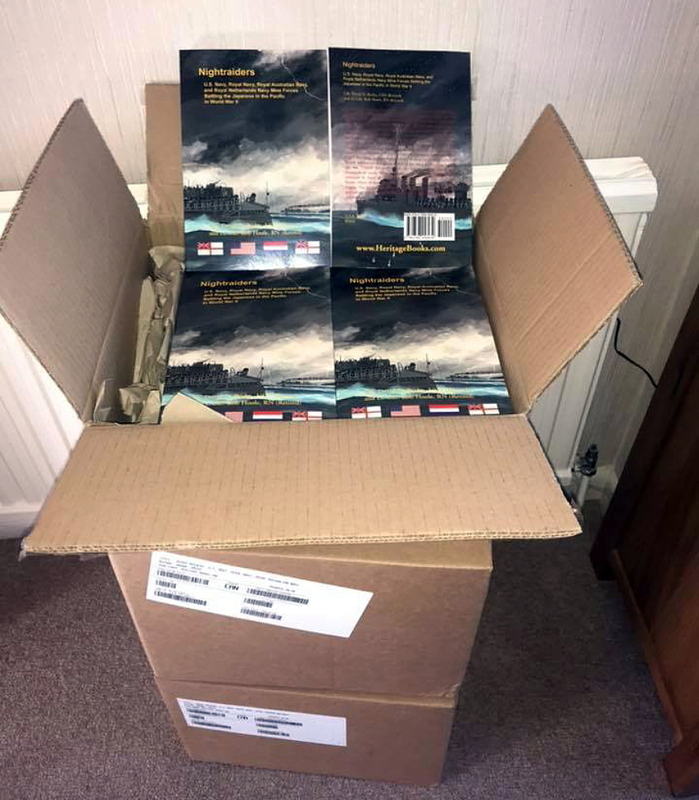 Alternatively, I am selling signed copies for £30 (including P&P within the UK and a £10 donation towards the installation of the Vernon Minewarfare & Diving Monument at Gunwharf Quays). Email me via myy Webmaster address for further details.. Signed copies of 'Home Waters - Royal Navy, Royal Canadian Navy, and US Navy Mine Forces Battling U-Boats in World War I', the first volume of the trilogy, are still available at the same price and conditions but only £26 if ordered with other book(s) as I can combine P&P. Contact me for further details. So far, the proceeds from personal sales have added £1,000 to the fund with more on the way. 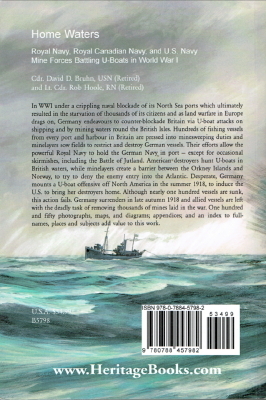 The third volume of the trilogy, titledd 'Enemy Waters'', will deal with minewarfare (minelaying, minesweeping and naval bomb & mine disposal at sea and on land) against Germany and Italy during the Second World War and is due to be released later this year. Note that every single penny collected by Project Vernon, plus 25% Gift Aid where applicable, goes towards the campaign to design, install and maintain the Vernon Minewarfare & Diving Monument. The project is a registered charity staffed entirely by unpaid volunteers who have raised over £250,000 to date. Congratulations to CPO(MW) L S Cooke, CPO(MW) R R Malcolm, PO(MW) J W Klein and LS(D) S J Dooley on beingg gazetted for the award of the Naval Long Service and Good Conduct Medal and to LS(D) S Cotterell RNR on beingg gazetted for the award of the 1st Clasp to the Volunteer Reserves Service Medal. 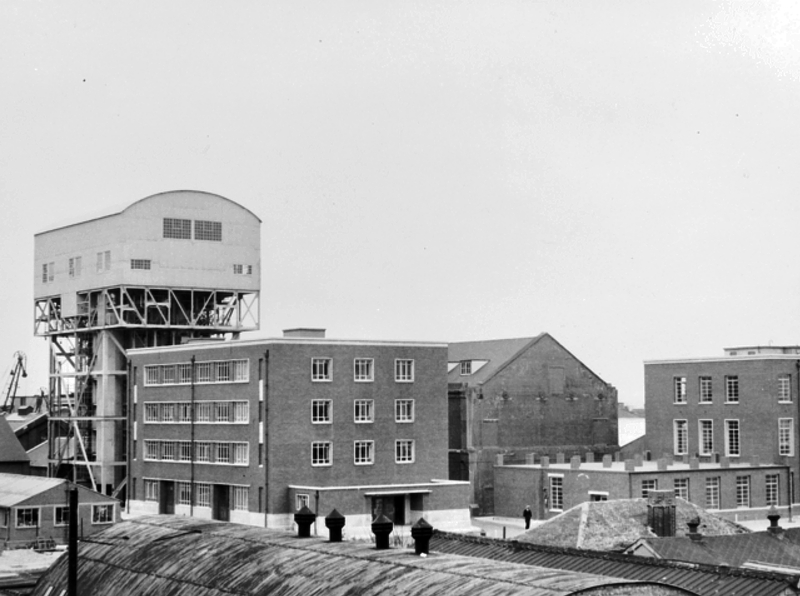 No one visiting HMS Vernon or its neighbourhood between 1917 and 1996 could have ignored the prominent Mining Trials Tank. 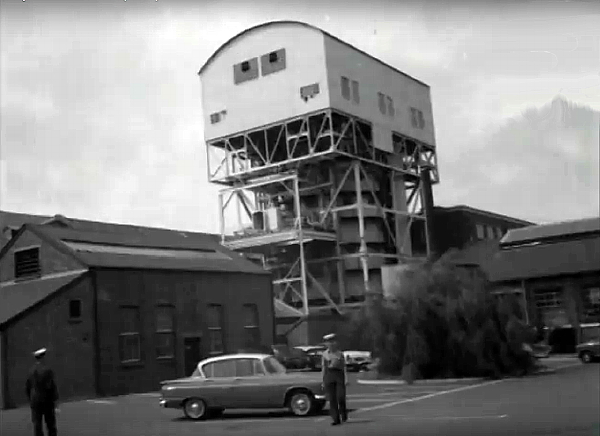 With its grey, steel-clad working platform towering 94 ft over Vernon's walls, it resembled a giant water storage tank, which of course it was; 55 feet of captive fresh water in a riveted steel cylinder supported by a steel gantry, topped by a rectangular work-top with all 'mod cons'. Originally supplied by the USA during the First World War to help resolve married unit failures in the North Sea mine barrage, the tank served the Royal Navy mine designers well until work on underwater weapons was concentrated at Portland in 1959. 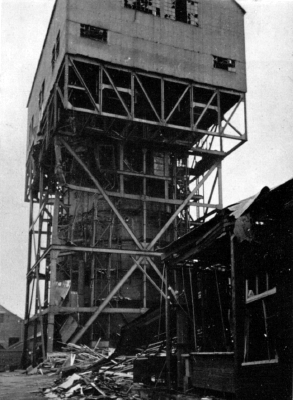 Many generations of mines were proved and improved by trial launches into the tank, coming to rest on the 'mat' to be observed through the ports on the various deck levels. Submerged minelays, simulating launches from submarines, could be conducted via an airlock halfway up the structure. 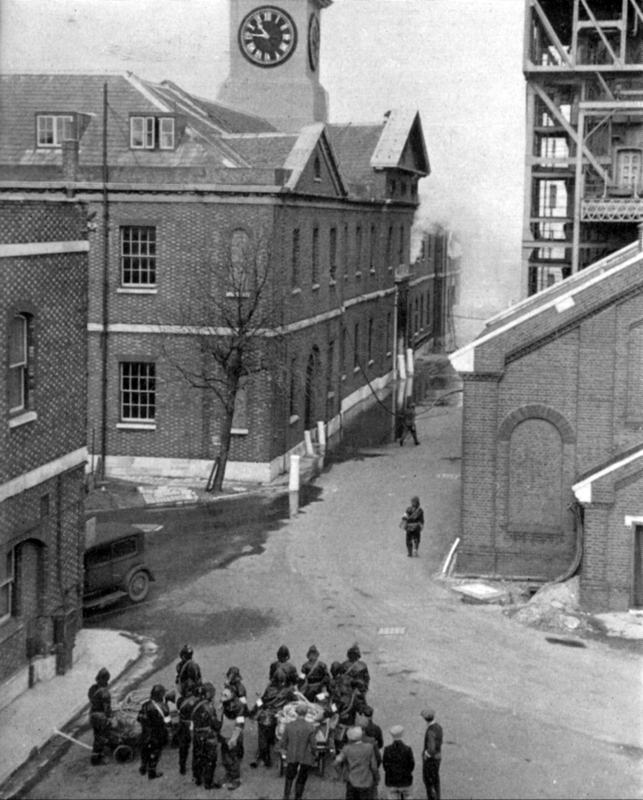 In March 1941, the tank suffered bomb damage during the Blitz on Portsmouth. 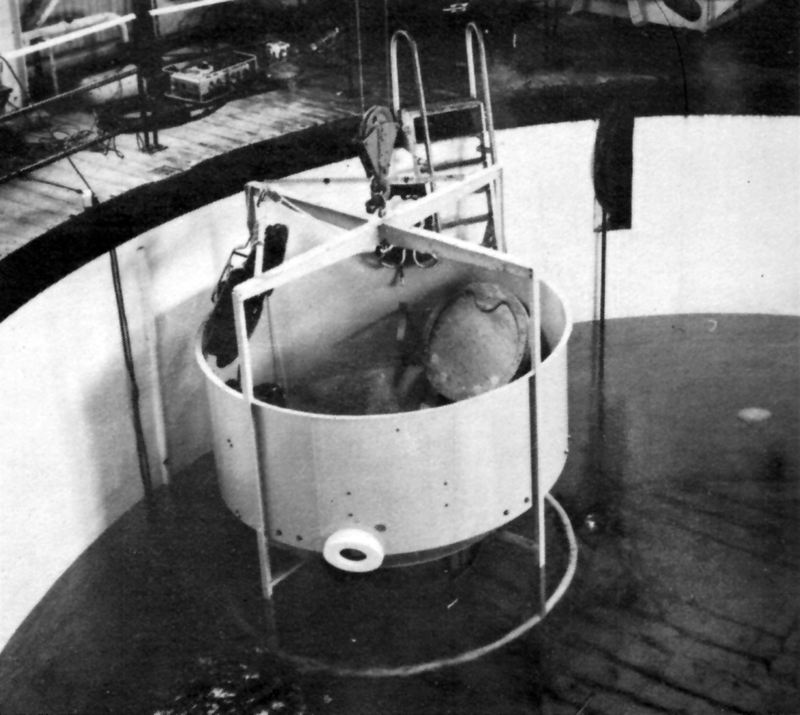 In 1943 and 1944 the newly captured Italian oscillating mine was put through its paces in the tank, sinking on launch until its electrically adjusted displacement plunger gave it buoyancy to rise again, only to gently sink from 2 metres depth and oscillate between this datum and 5 metres until its batteries ran down. When the tank passed into the administrative care of the Officer-in-Charge of AEDU (Admiralty Experimental Diving Unit) circa 1959, a major refit was put in hand, the now little-needed mine rails were removed, though a set was preserved on a portable base and stowed away. 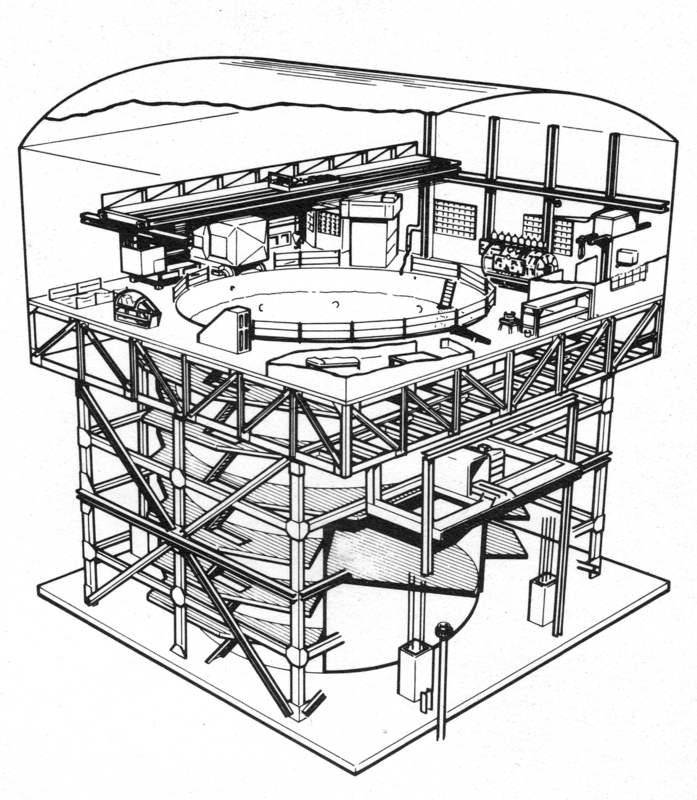 Changing rooms and shower facilities' were built in, and a diving compression chamber with two compartments was incorporated. 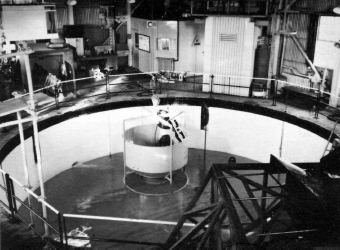 New lighting was installed and the tank provided excellent trial service for any underwater equipment which required the chance to operate in water down to 50 ft. A column of sea water 55 ft high and 30 ft diameter was housed in a white painted tank. The water was constantly filtered and had a visibility of about 30 ft. The top 10 ft could be heated by steam injection. 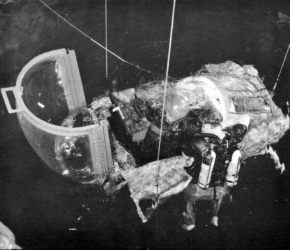 High pressure air was available at 4,000 psi and the compression chamber had a maximum depth of 200 ft. A moving platform, 'the mat', covered the whole base area and could be moved and lowered under control to any depth, or to the bottom. Alternatively, equipment could be lowered, launched, dropped, or fired into the water, observed or filmed on its performance either from outside through the ports or by diver swimming with the apparatus. External lights were available on the ports at choice and scuttles were spaced every 10 ft on each of the six floor levels. Staff divers, underwater photography and closed circuit television were available, and any additional instrumentation could be imported by the user. A six-person lift made access easy and a 2-ton travelling crane raised heavy equipment through an access hatch, from ground or lorry level. The tank was made available for use by all concerns and was loaned to a number of industrial clients engaged on Government contracts. This photo appeared in the summer 1966 issue ((Vol 13 No 2) of the RN Diving magazine published by the Diving Training section in HMS Vernon and was taken beside the compression chamber at the top of the mining trials tank. The model wearing old-style SABA (Swimmer's Air Breathing Apparatus) was Miss Wendy Williams who worked in AEDU's drawing office at HMS Vernon. 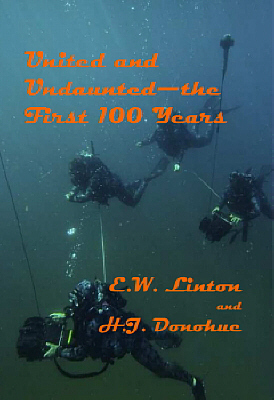 She had joined from Bath as a relief for Miss Helen Unstead, a keen sub-aquarist. In a very short space of time, Wendy was X-rayed, medicated and blood-chitted before being pushed in the shallow end. She became fairly competent at 40 feet and was "hoping to go deeper" in the near future. A 'staple diet' of later years was the routine training of fixed wing and helicopter aircrew in ditching drill. A mock-up cockpit and a helicopter cabin nicknamed the 'Dunker' were installed, and realism added by a gearing which turned the cabin over on entry to simulate the helicopter motion on entering the water. This training was extended to include RAF Search and Rescue crews. Its value was proved over and over and courses included North Sea oil company staff who regularly used helicopters for visiting oil rigs in the North Sea. The aim of the course was to give confidence, overcome fear and demonstrate that properly trained aircrew could make their escape from the most difficult of situations. 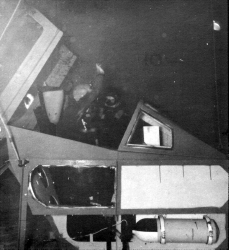 Helicopter aircrew were briefed fully on the danger of disorientation and had to escape from the module in a variety of situations. It was important that they remained strapped into their respective seats until all movement ceased and then made their escape. This took approximately 10 seconds to accomplish. Divers were in a position within the module to assist in the event of an emergency. 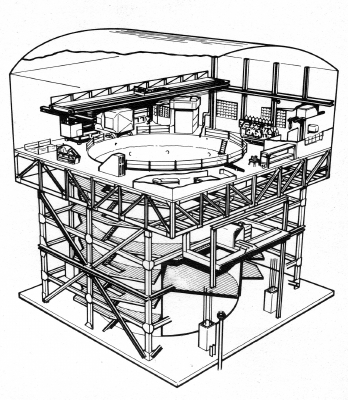 The tank could be darkened to simulate moonlight conditions. By the end of 1975 over 17,000 people had completed the Underwater Escape Training Course at HMS Vernon and more followed until 1985 when all RN dunker training was consolidated at thee Underwater Escape Training Unit at RNAS Yeovilton. 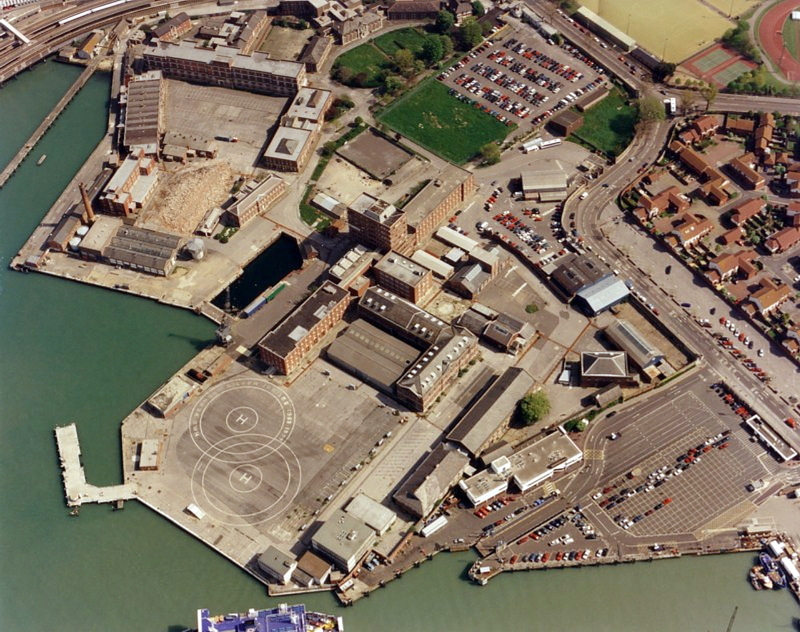 HMS Vernon's Mining Trials Tank was demolished in 1998 in preparation for the Gunwharf Quays development. While you were possibly nursing a sore head on the first day of 2019, the crew of HMS Shoreham were scouring the depths of the Gulf. 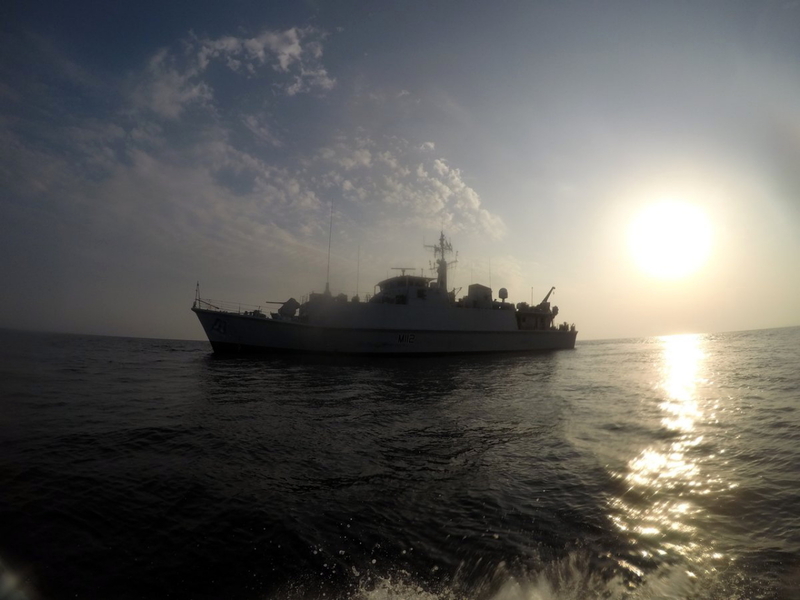 The minehunter was on patrol on New Year’s Day, rolling out her dive team for a plunge into the murky but mild waters off Bahrain. January is the coldest month in the kingdom, which is the hub of RN operations in the Middle East: it gets down (wait for it…) to the low 20s Celsius on land and a similar sea temperature (compared with 4°C ashore and about 9°C in Shoreham’s home of Faslane on the Clyde). 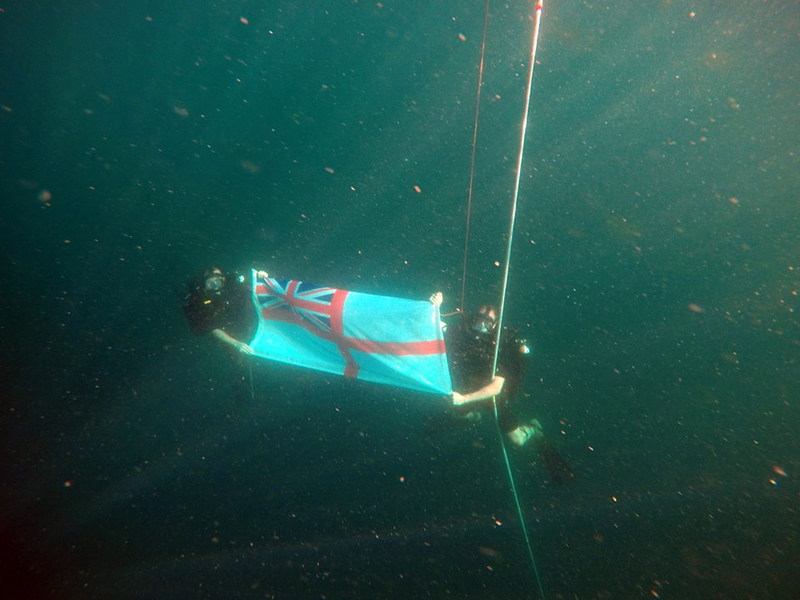 As well as practising the art of neutralising a (dummy) mine during the training exercise, the dedicated seven-strong dive team decided to take the Royal Navy’s standard into the water, unfurling the White Ensign for an ‘underwater selfie’. 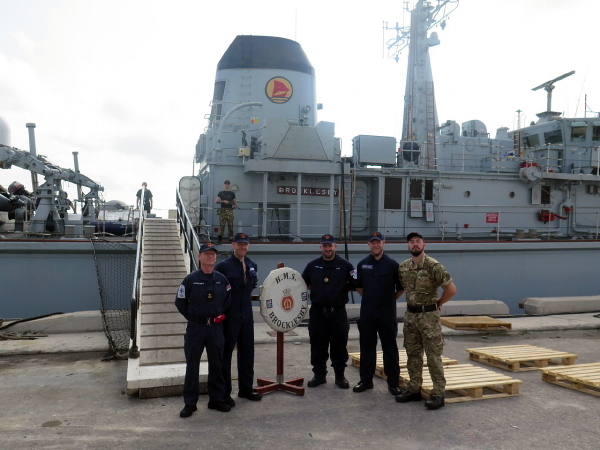 The Sandown-class ship is one of four Royal Navy minehunters stationed in Bahrain for three years at a time, supported by a mother ship (currently RFA Cardigan Bay), a battle staff, and a dedicated team ashore at the UK’s new Naval Support Facility. 2 Jan 19 - Happy New Year!! 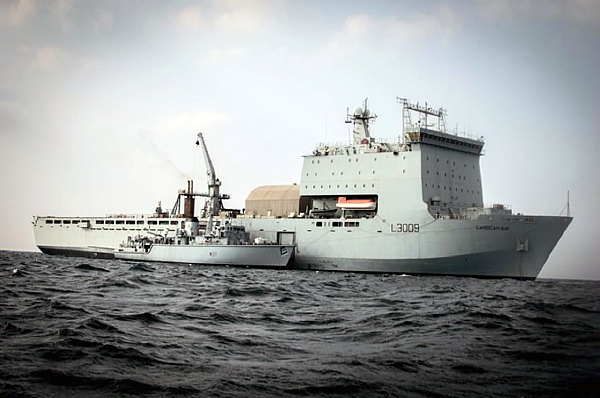 Happy New Year to all members of our community, particularly to our MCM forces currently deployed overseas. Click on the linked dates to see all associated photos and videos. 1 Jan 2019- Happy New Y ear 19 from RN/RM RFA & Army personnel deployed supporting UK's Mine Counter Measures Force. 13 years deployed. Thanks for your support. We couldn’t do it without you. 2 Jan 2019 - Four Royal Navy Mine Counter Measure Vessels are at sea on operations over the festive period alongside RFA Cardigan Bay. Cdr Steve White RN visited HMS Ledbury, where he received a Birthday cake! 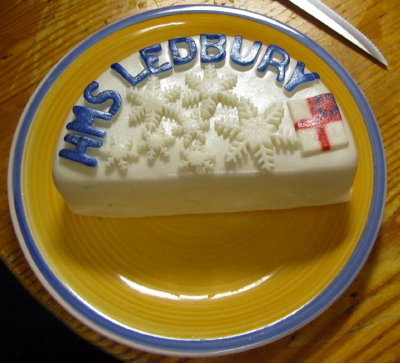 Happy Birthday Boss from HMS Ledbury, HMS Shoreham, HMS Blyth, HMS Brocklesby and COMUKMCMFOR. 1 Jan 2019 - Happy New Year 2019 from HMS Brocklesby and Crew 8. It might be New Year's day but work continues on board M33 here in Bahrain. 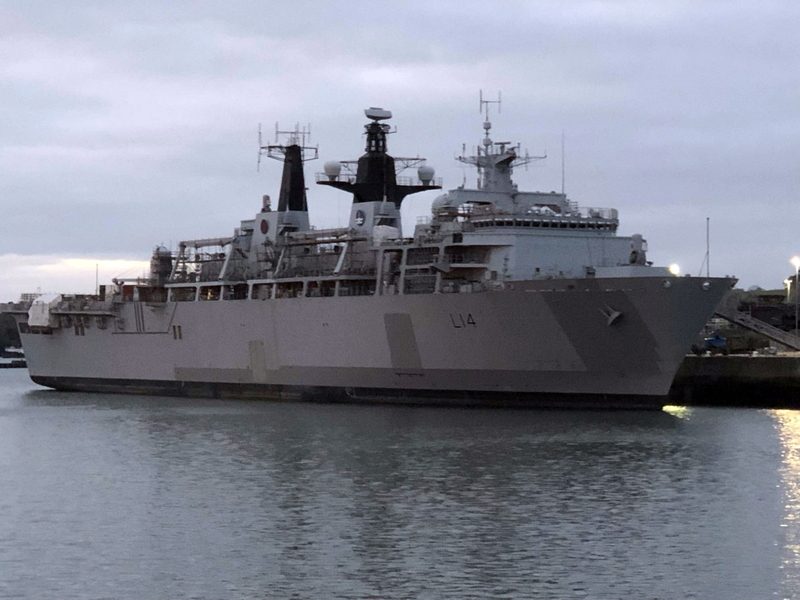 1 Jan 2019 - For MCM1 Crew 7 deployed on Op Kipion in SHOREHAM, the New Year was seen in on operations.